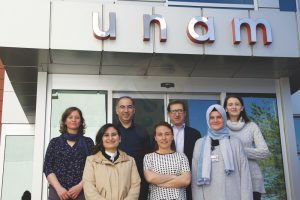 Researchers at the Bilkent University National Nanotechnology Research Center (UNAM) and an industrial partner, Nobel Pharmaceuticals, are collaborating on a project that aims to develop a new generation of bifunctional antibodies for clinical use in the treatment of cancer. A milestone in the project has recently been achieved at UNAM with the formation of the molecular constructs of four bifunctional antibodies and the creation of cellular clones. The work at UNAM is being conducted in the Synthetic Biosystems Laboratory (SBL) led by Assoc. Prof. Urartu Özgür Şafak Şeker. SBL, which is part of UNAM’s life sciences division, is responsible for designing the molecular constructs and clones and for carrying out the initial production and characterization of the antibodies, while Nobel Pharmaceuticals will conduct functional studies on animals. The project is supported by TÜBİTAK’s priority areas research program. Dr. Şeker and SBL team members Ebru Şahin Kehribar, Recep Erdem Ahan, Elif Duman and Behide Saltepe are employing advanced genetic engineering and protein engineering techniques in order to complete their portion of the project as expeditiously as possible. When the initial research phase is done, and while the clinical trials are being performed, industrial production of the antibodies will begin. Nobel Pharmaceuticals, a Turkish company founded in 1964, conducts business operations in over 20 countries and allocates 5 percent of its annual turnover to research and development activities. In conjunction with the growing prominence of biotechnological drugs and approaches in medicine, SBL and Nobel plan to extend their collaboration to develop a new generation of drug candidates employing advanced biotech approaches.